Seven decades after the Nazis annihilated the Jewish community of Tomaszow-Mazowiecki, Poland, comes a gripping eyewitness narrative told through the eyes of one of the youngest survivors of the Holocaust, as well as through first-hand accounts of other Tomaszow survivors. 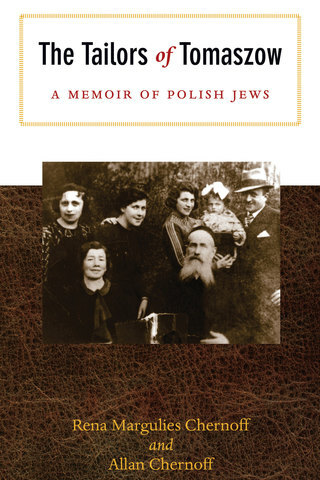 This unique communal memoir and history presents a rare view inside the extinguished society of Eastern European Jewry, before, during, and after World War II. It is both the memoir of a child and of a lost Jewish community, an unvarnished story in which disputes, controversy, and scandal all play a role in capturing the true flavor of life in this lost community. Nearly 14,000 Jews, one-third of the town’s population, lived in Tomaszow-Mazowiecki before World War II, many making their living as tailors and seamstresses. Only 250 of them survived the Holocaust, in part because of their skill with a needle and thread. Engaging and highly accessible, The Tailors of Tomaszow is a powerful resource for educators and a compelling read for anyone wishing to gain a deeper, more personal understanding of Eastern European Jewry and the Holocaust. "I like this book very much. I am impressed with both its understanding of the world before the Holocaust and its depiction of Auschwitz. A serious work indeed." "Well written and moving, this book is recommended for all synagogues and community libraries." "... a stark and powerful account of her hometown, combining the voices of survivors and serious research not previously compiled." "Unforgettable. The Tailors of Tomaszow is a genuine and truly insightful portrait of European Jewry’s lost culture"
"I like this book very much...A serious work indeed." "...recommended for all synagogues and community libraries."